Some of the sales surge may be attributed to closings that were pushed into August from July, which had fewer business days than normal. The overall number of homes for sale declined 13.4 percent since last August, resulting in just 1.3 months of supply on the market—the lowest level on record since 2009. Across the broader D.C., Maryland and Virginia region, the median sale price gained 0.7 percent in August from last year, to $380,000. 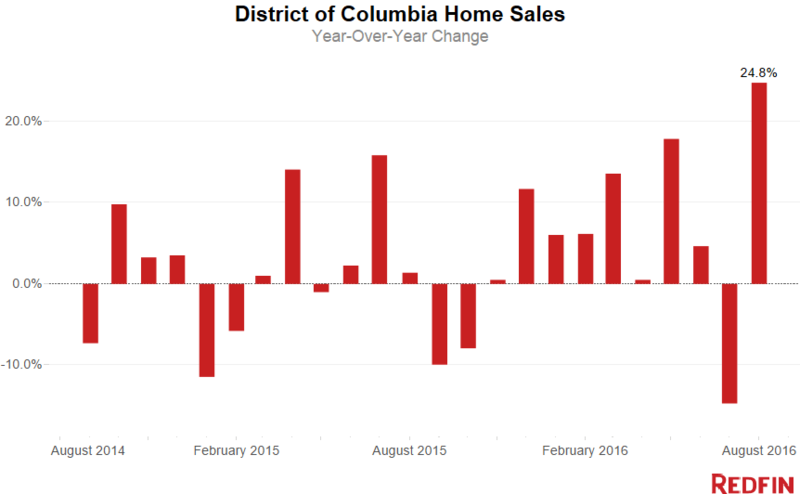 Washington D.C. home prices increased 9.8 percent in August from a year earlier to a median sale price of $576,500. August sales surged 24.8 percent compared to last year. Some of the sales surge may be attributed to closings that were pushed into August from July, which had fewer business days than normal. Overall, the District has had strong sales this year, with year-over-year growth every month except July, despite the fact that the number of homes for sale remains low. 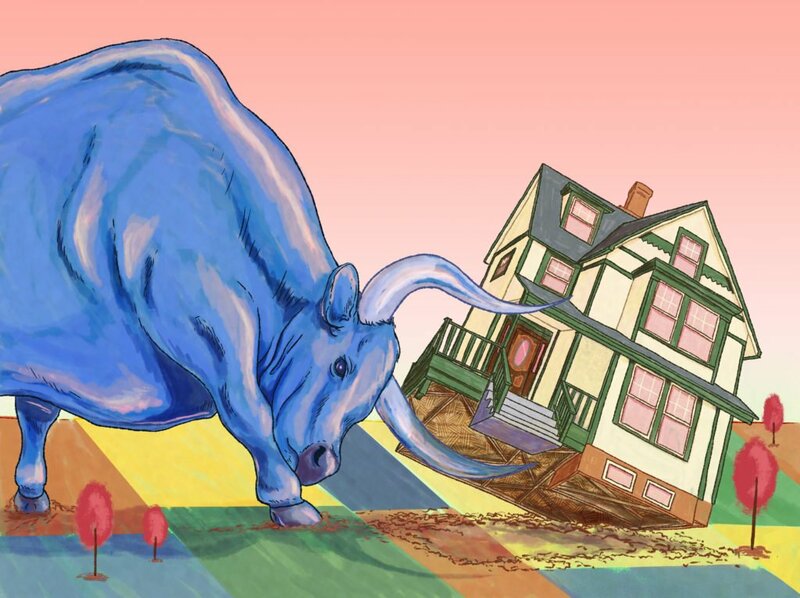 The overall number of homes for sale declined 13.4 percent since last August, resulting in just 1.3 months of supply on the market—the lowest level on record since 2009 and well below 6 months, which signals a balanced market. Solid buyer demand coupled with the shortage of inventory kept conditions competitive. The typical home found a buyer in 18 days, and 34.6 percent of homes were bid up, selling for more than their initial asking price. What’s happening in the metro region? 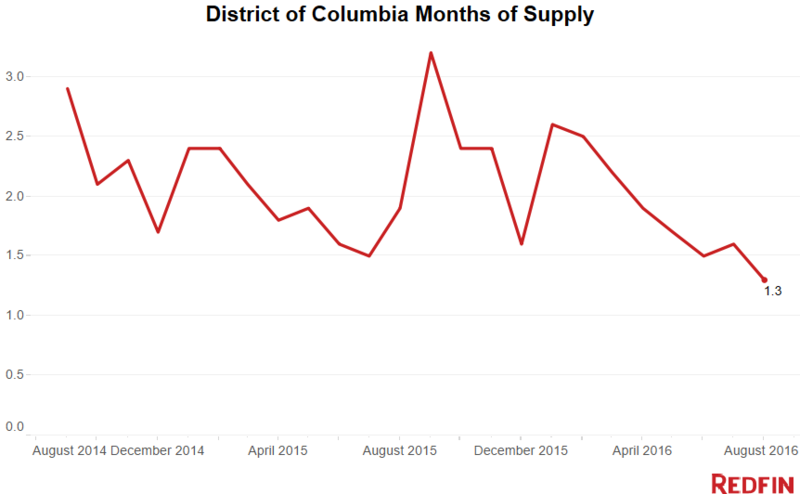 Across the broader D.C., Maryland and Virginia region, the median sale price gained 0.7 percent in August from last year, to $380,000. Home sales were up 24.4 percent compared to last year, matching strong sales growth in the District. The number of homes listed in August fell 4 percent, pushing the total number of properties for sale down by 21.5 percent from last year. The region had a 2.2-month supply of homes for sale, while the typical home found a buyer in 30 days. A perennial favorite among buyers, Capitol Hill has seen a shortage of available homes for sale all year. Inventory was down 48.1 percent in August. The median sale price was up 7.3 percent to $850,000, and the average home was snapped up in 11 days. The boom in residential and commercial development in Navy Yard and Southwest pushed home prices up 28 percent and 16 percent respectively. Buyers are drawn to new amenities and park spaces and the promise of a redeveloped waterfront. In four neighborhoods, at least half of homes sold above their asking price: American University Park, Mount Pleasant, Petworth and Navy Yard. 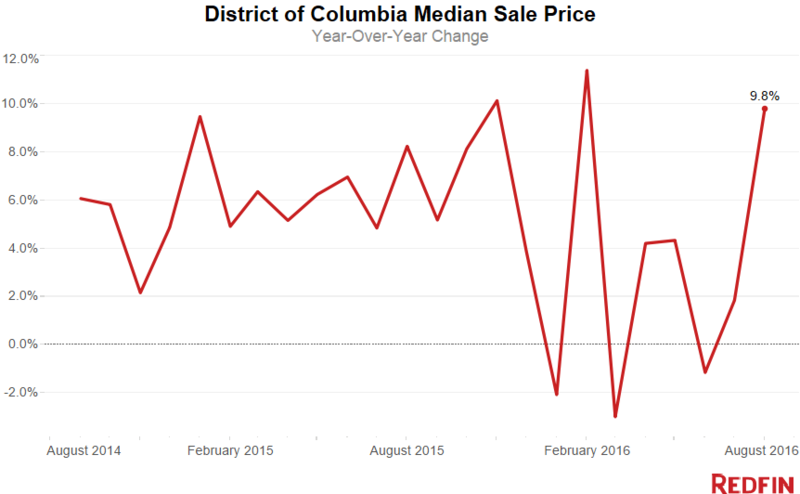 See Redfin’s city page for up-to-date data on Washington-area home prices.